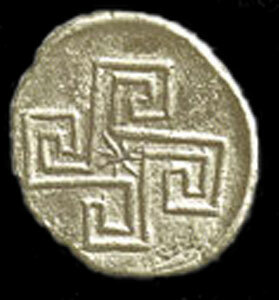 Cretan coin bearing an image of four meanders, stand-ins for the labyrinth, at the center of which resides a star: Asterion. Most people in the west, where the commonly traced forefathers of our society are the ancient Greeks, will have heard of the Minotaur. Half-man, half-bull, this mythical creature is known as the vicious man-eating monster found at the heart of the Labyrinth. But the Minotaur is not Greek. He is Cretan. His Hellene-given moniker means “Minos’ bull”, with Minos being the King who lived at Knossos, the creature’s step-father. Born of Queen Pasiphae, a goddess herself, and Minos’ sacrificial bull, the Minotaur was not a monster; he was a brother, and a prince, and a god-made-flesh. His proper name was Asterion, “ruler of the stars”. His story begins with his conception. King Minos of Crete was given a white bull by Poseidon, and expected to sacrifice it to the god at a later date. Believing the god would not care over the difference, in place of the finest bull, he gave up a lesser animal. This did not go over so well, and his wife, Pasiphae, had a curse placed on her that caused her to lust after the white bull as punishment. The Queen had the inventor, Daedalus, create a hollow bull from wood to attract the one she desired. She climbed inside, and wound up conceiving Asterion. The half-man, half-bull was kept inside the center of the labyrinth. Sacrifices were brought to him periodically from Athens as payback for the Athenians slaying another prince of Crete. On one of these occasions, Theseus, prince of Athens, volunteered. Ariadne, another child of Pasiphae, fell for the young man and offered him a means to escape the labyrinth: a spool of thread. He went into the labyrinth, slayed the Minotaur, then escaped by following the thread and retracing his steps. He took Ariadne, and fled the island, victorious over the monster. But what can be gathered and gleamed of more original versions of the story is so much more. Digging a little further into available theories, we find versions that paint Asterion as a helpless victim, as a sympathetic and pitiful tragic figure, and as simply misunderstood. We also find versions that portray him as a god. As deity taken the form of a bull. Of a ruler, and a king. A star, luminous and bright at the heart of the underworld that was the labyrinth. As the scholar Carl Kerenyi so eloquently wrote, upon him was “conferred the hope of a return to the light”. Asterion’s death was not the slaying of a monster; it was a dark sacrificial rite. Regarding UPG, this area is still mostly unexplored, and so I do not have many thoughts in order well enough to express them in words. But that is the sentiment I want to leave the topic on until I pick it up again in later posts: Asterion, the Minotaur, as starry god of Crete and as incarnation, the meeting of divinity and flesh. 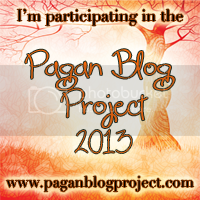 This entry was posted in Uncategorized and tagged Asterion, PBP2013. Bookmark the permalink. Fascinating – but harsh that Pasiphae got the curse because Minos tried to do one over on the Gods. Or were they in on the scam together? Yes, I can see how it could be pretty harsh. I have not looked into why she got the curse instead of him, or whether all versions of the story consider it necessarily a curse versus some form of epiphany (like Zeus coming to Leda in the form of a swan, which is what I am leaning towards instinctively). From a more Greek perspective, it makes sense it would be seen as a curse, especially since all they took Asterion for was monstrous. Pasiphae and Minos were not in on the scam together. I have not verified this yet, so please take it with a grain of salt, but I think in Greek culture, the wife was considered part of the husband’s household. Her actions and behavior reflected back on him. For a proud king, perhaps a worse curse than one that affected him directly, was to affect someone close to him in a result that caused great embarrassment and that he could not control. Unfair to Pasiphae, yes. But driving home the point? Definitely. Thanks so much for the extra info! I was thinking it might have been along ‘wife as property’ type lines, but the idea that it was a means of bringing great embarrassment to the King, and the Queen was just collateral damage along the way, is an interesting angle I hadn’t considered. The more I learn about how he’s been oversimplified in the myths, especially the more modern retellings, the more I want to hear about Asterion. Can’t wait to see more posts on the subject. I honestly have not done near as much digging into the subject as I would like, because it gets pretty heavy very fast for me. Having the historical context that the story is generally told from the point of view of a foreign nation with no knowledge of the culture it comes from helps explain the oversimplification, but it still is upsetting. I did not know what to say in this post, so it is very much a kind of, “eh…I will get to it later” springboard. That’s a lovely story. Thank you for sharing it! Fascinating story and very well written too. Excellent! You UPG about it interests me. About two months ago I looked into Asterion because I had an experienced this ting with a bullheaded being on a journey and I have no idea who he was. He accompanied a storm that went through the area and… it was strange. But it gave me some insights into coming events in a weird way. I had not known prior to reading this that he was reawakened in the form of a human. Interesting! My UPG on Asterion right now is pretty much a muddled mess that I have not sorted through. I had hoped to do so with this post, but did not quite get there! So I will be posting more on him in the future as I get things worked out. I have read different accounts of how the whole “half-man, half-bull” thing works out. For certain eras of history, it was bull-headed; others, it was bull-bodied with a human head and torso, kind of like a centaur. Other more modern, scholastic theories are that he was a man wearing a bull headdress, which was interpreted by the Greeks as being actually part bull. I do not have a personal opinion on this, but thought it might be useful for you regarding your own experiences, which are really interesting! In my UPG, Asterion was, to borrow a foreign expression, an avatar for another god. I have had experiences of this god, but do not have a more original, non-epithet name for him as of yet. This god took on various forms throughout Cretan history (and other cultural histories as well), including human. So when I read the bit about reawakening in the form of a human in Carl Kerenyi’s “Dionysos: Archetypal Image of Indestructible Life”, it was a bit jarring. Unfortunately he did not go much further into it, however. Thank you so much for your comment and sharing your experiences with me! Asterion’ death being a sacrificial rite makes sense in a spectacular number of ways, and I look forward seeing you exploring the subject further. I am working a lot with Ariadne, exploring the Labyrinth ( as I believe the Labyrinth to be Ariadne as a goddess in a number of ways I don’t yet fully grasp ) and recording UPG on Her side of the story. A lot of who Ariadne is and stands for in matter of cosmic function ties back to sacrifice (and love) so it’s particularly interesting to see how everything tis together, beyond the classically accepted version of the myth. Ariadne as human is the one chosen to administer sacrifices to her brother Asterion – she chooses the youths that enter the labyrinth and that eventually brings her to meet Theseus, Athena’s protege, and to be instrumental for Asterion’s sacrifice. That act sets the fall for the explosion of her madness, and then by joining Dionysos and reaching Apotheosis She becomes the one who slays Her beloved with their court of Maenads. The theme is there and there’s a sort of mysterious play of forces beneath. Thank you for this comment, it is very interesting. And for the sake of full disclosure, which I am fond of, I wanted to let you know that I have skimmed some of your blog in the past and enjoyed it, and that seeing your comment in my inbox this morning made me both happy and intimidated. I look forward to reading more of your posts in the future, too. oh, an Ariadne post? Definitely anticipating that, now! HI, I need to write some lines on the subject of Assertion as. Bull God, could you indicate some bibliography, please? Thanks !!! Of course! That information was originally UPG, but I was able to verify it later. Karl Kerenyi, a well respected scholar of the subject in the 1900s wrote on Asterion as relates to the Minotaur in his book “Dionysos: Archetypal Image of Indestructible Life”. (Page 105) in the 1996 edition by Mythos publishing. So according to Kerenyi, the myth has three stages, one of which includes the god being born into a half-bull (the Minotaur), and later, a human. I hope this works for you! If not, please let me know and I will see if I can dig up other sourcing if need be.